Ah, the dining room; our trusted friend when it comes to hosting a dinner party, which helps us remember the important things in life: good times and good food. 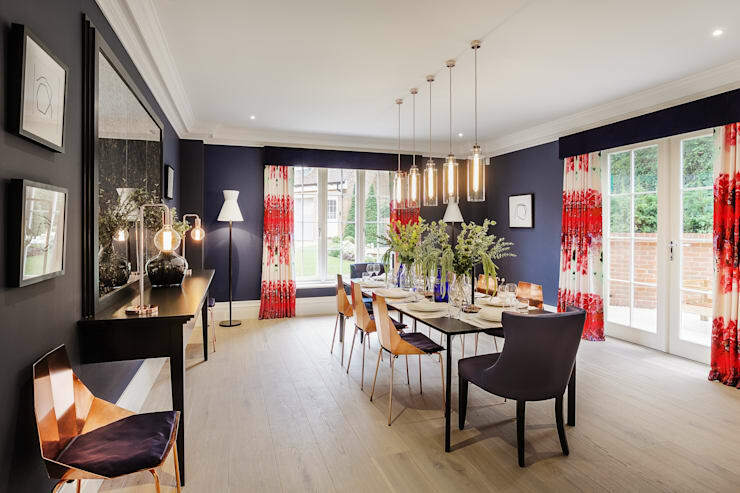 In that spirit, we wish to celebrate the trusty dining room by showing off 10 beautiful examples, each one in a different design. From classic to Asian, and from modern to Mediterranean, each of our examples flaunts its own layouts, colours, and décor. And to get into the spirit of dining, we are adding our choice of dish to each example that we think would go simply splendid together. So, have a seat, and enjoy having your imagination (and maybe taste buds) tickled. Ah, the classic style; a refined design that is rich in details, not just in the furniture, but in the lighting, décor, wall art, etc. As can be seen in our example above, the furniture is the “art” type, with decorative details adorning those chairs. A plush rug ensures a soft surface, while a starry ambience is afforded through that delightful ceiling lighting fixture. Our dish of choice: Oysters on the half shell with mignonette sauce, served with Champagne. Bless your soul for thinking that an Asian-themed dining space consists of guests sitting on the floor. That is clearly not the case with our example above. Lots of wood, a harmonious flow of energy, and a handful of antiques conjure up a very comfortable Asian-style dining space above that takes a more contemporary route than the typical ancient Japanese styles we often think about. Our dish of choice: Indian-Spiced Salmon with a good Merlot. No need to imagine cowboys and saloons – the modern country style can be just as chic and glamorous as you want it to be. 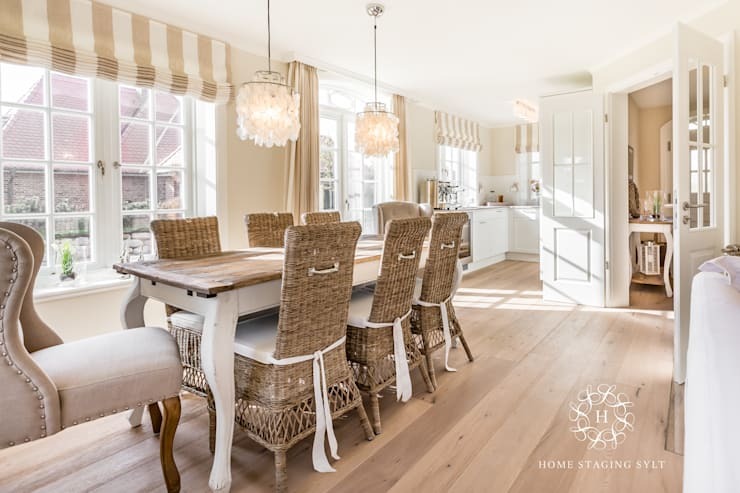 Characteristically casual and cosy, the country style loves making use of wood and second-hand furniture, yet there is nothing second-hand about our country dining space. A stylish mix of timber, wicker, and soft fabrics make up a very charming space that is adorned with earthy neutrals. 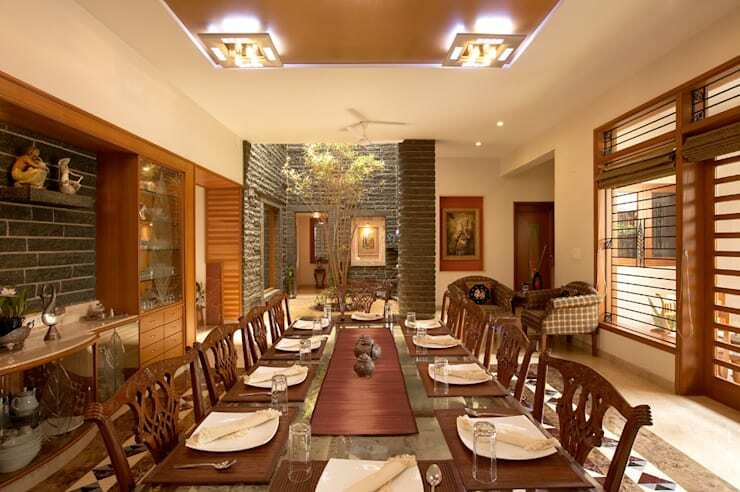 Homey, inviting, and just the place where you can enjoy a delicious home-cooked meal. Our dish of choice: Home-cooked chicken, maize and mash, served with good old-fashioned ice tea. Think modern mixed with antique, and clash a bunch of colours, then you’re on the road to eclecticism. 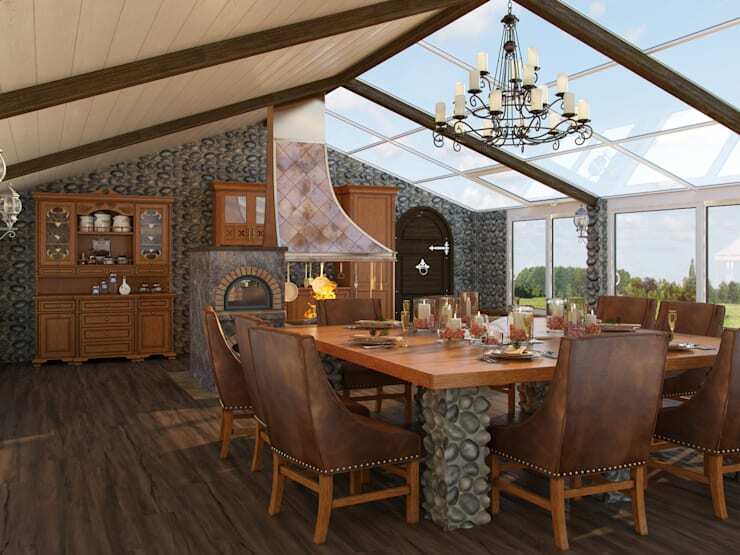 And just like this style, our dining room above is not afraid to mix it up. 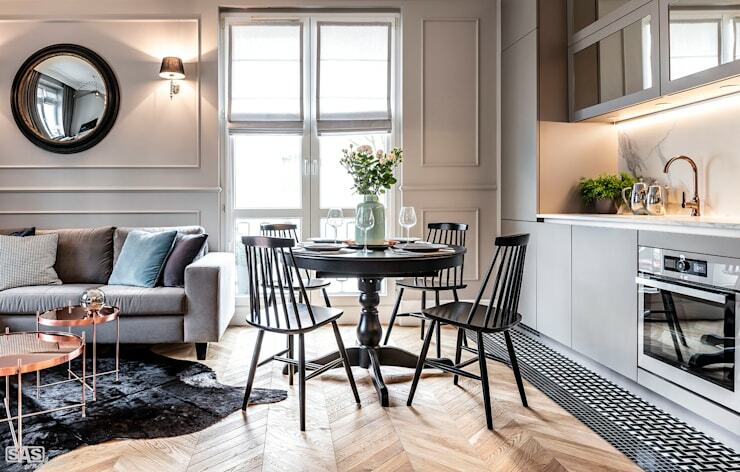 Country-style dining chairs, light parquet flooring, shining steel, and a rug skin added for texture, this little dining spot ensures a multitude of possible dialogue starters once the conversation dries up. Our dish of choice: Beef Provençal and sun-dried tomatoes paired with a Chianti. The Mediterranean style conjures up a world of different images, from white-washed buildings in Santorini to patchwork fields of Tuscan wineries. And they’re all correct! Our choice of dining room above opted for a slightly “beach house” feel. 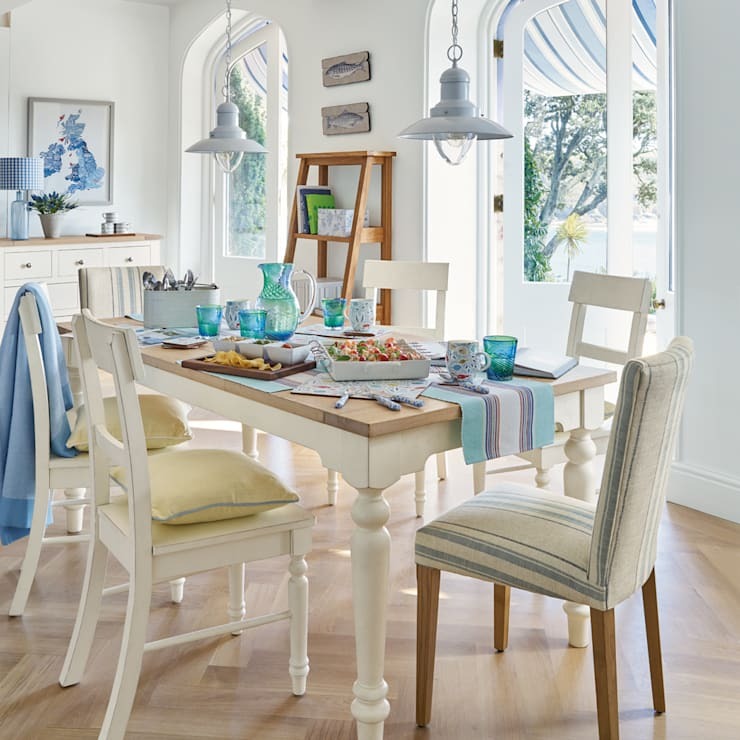 Light timber, cool and calm colours, and décor bringing up fantasies of fishing and island vacations. Our dish of choice: Griddled chicken with quinoa Greek salad, washed down with an aromatic Viognier. From a dining room to an entire house, get: A Taste of Mediterranean Style. Less is more here, so eliminate any furniture without compromising comfort or liveability. But that does not mean ending up with a bland space. Our minimalist dining room still has all the must-have elements, plus a handful of decorative items, and it is far from cluttered. The muted tones and clean floors add to the visual spaciousness, ensuring that the only loud things at this dinner party will be the company. Our dish of choice: Spicy tofu stir-fry paired with a Japanese or Thai beer. Clean and simple, yet far removed from the minimalist style. 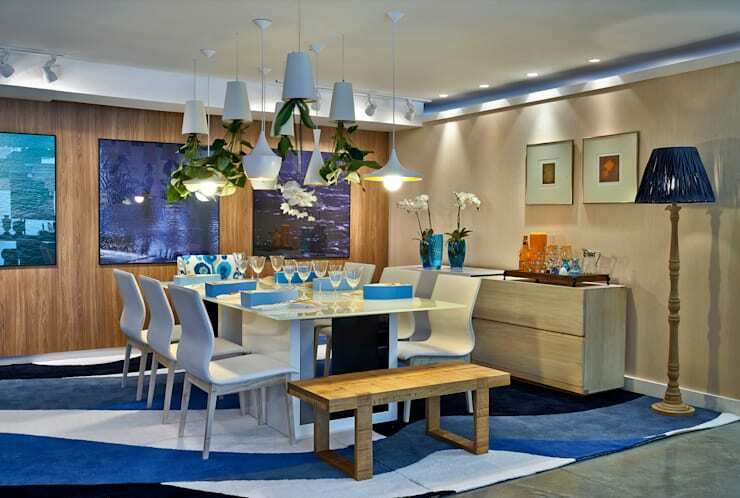 Our modern dining room flaunts geometric shapes and smooth curves, and is not afraid to mix neutrals with hot tones. Wooden surfaces are combined with glossy metals, a typical feature of the modern style, and we think it works splendidly in this example. 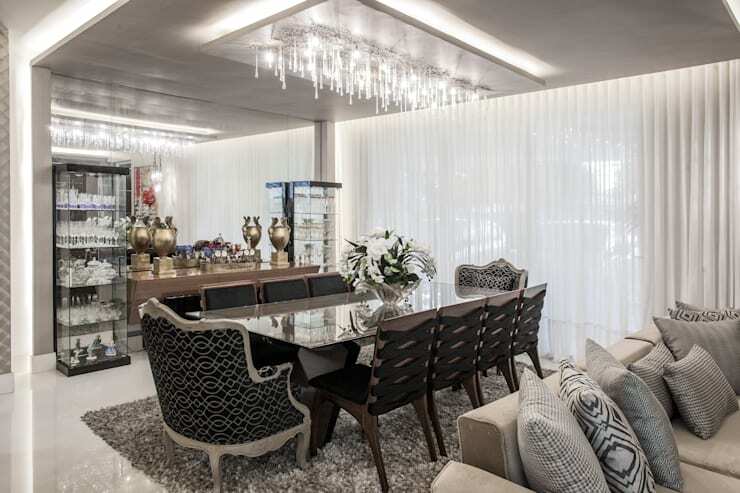 Plus, any space that has ceiling lights mimicking champagne flutes gets our vote of approval. Our dish of choice: Any nouvelle cuisine that puts effort into a striking presentation, and an accompanying French wine. Think nature when conjuring up visions of the rustic style: tree trunks, logs, branches, rough stone, etc. This style structure depends on crude, rough details, and is typically found in mountain vacation homes or rural settings. Our example above makes use of a decadent dose of wood and stone, yet does not substitute one inch of style or substance. Our dish of choice: A lamb stew served with a Cabernet/Merlot blend. 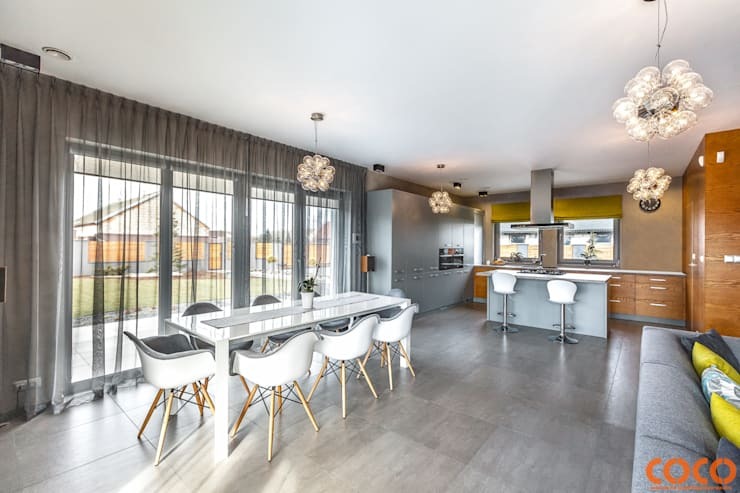 Gentle colours, playful accents, and a fine balance of engineered and organic materials is what you get when you opt for the Scandinavian style. 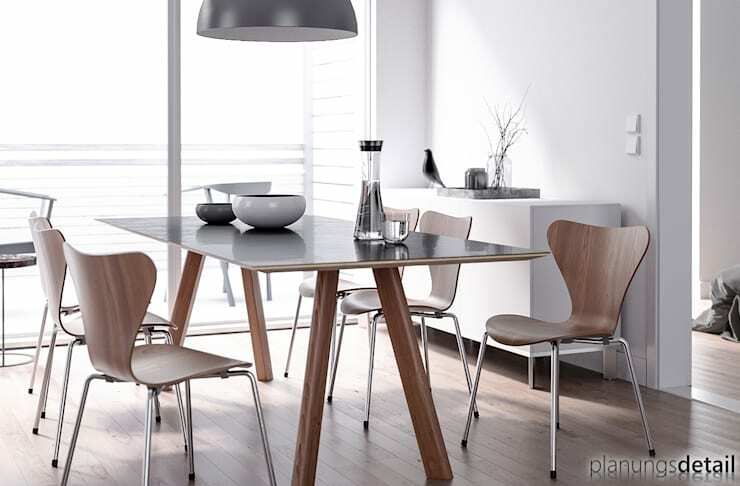 As is evident in our dining room, the furniture is simple, contemporary, and functional. Slim surfaces ensure plenty of space, and you almost get the idea that you need to whisper in order not to disturb this delicate room. Our dish of choice: Norwegian cod and root vegetable chowder with Chardonnay. You don’t need to plant a palm tree indoors to enjoy a tropical vibe; natural materials (like wicker, rattan, or bamboo) and fabrics with an oceanic vibe (featuring palm leaves, lattice prints, coral designs, etc.) can be just as effective. Our tropical dining space above is just what the doctor ordered to ease the stress and conjure up tropic scenery. Plus those myriad of blue tones and plant life dangling from above don’t hurt either. Our dish of choice: Caribbean crab cakes served with a Sauvignon blanc.